Looking after the younger ones can often make the difference to the holiday so having a safe environment where they can ski or play is essential. Below is some information on the Kindergartens which should help you make plans, however, please email us for anything specific. The snowpark accepts children from 4 years to 8 years. 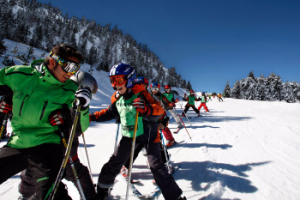 The activity aims to help children discover skiing by playing games in the snow in a special reserved area under the guidance of special qualified instructors. Children must be dressed suitably for snow conditions and equipped with all the essentials such as sunglasses/goggles, helmet, gloves, suncream. The children will be able to play with various toys as well as participate in arts and crafts whilst fully supervised by qualified staff. The children can enjoy the fun and games with “Pocoyo” in the supervised area. Lunch can be included for an extra charge. Nappies and baby food must be provided if required. 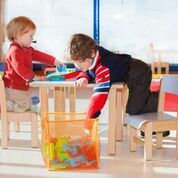 Grandvalira has 4 child care centres which are located in Canillo, El Tarter, Soldeu & Grau Roig. The centres at El Tarter, Soldeu and Canillo only accept children from 24 months, children upto this age must go to Grau Roig centre. The snowgarden is an area of pistes designed specifically for the children and equipped with games to help them learn how to slide on real snow. This is the same in all 4 Grandvalira centres. At the end of the course the 3 year old children will be familiar with their ski equipment, be able to move along the flat on 2 skis as well as be able to go down gentle pistes in a controlled manner. 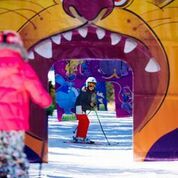 The children aged 4 to 5 will have skied a bit more and be able to enjoy the gentle pistes as well as be a little more independant on the skis. The children will progress at their own pace and there is no rush to learn, the most important thing is that they enjoy their time on the snow. At the end of the course, there will be a party as well as a certificate and a gift for each child. You must provide your own equipment in advance for the children and it’s not possible to rent on the pistes. All children must be suitably dressed and have the essentials such as a helmet, goggles/sunglasses, hat, gloves, suncream. This service is offered in all the resorts including Pas de la Casa. There are groups for complete beginners, intermediate and advanced levels. There will also be a party at the end of the course with a certificate and gift for each child.